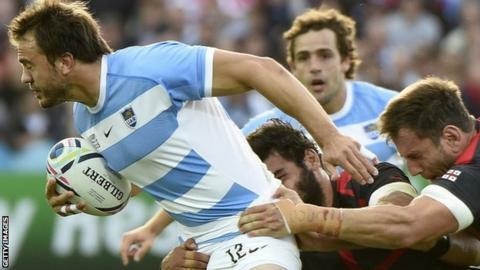 Argentina scored three tries in five second-half minutes to defeat Georgia at Kingsholm and claim their first win in Pool C of the 2015 Rugby World Cup. Tomas Cubelli, Juan Imhoff and Santiago Cordero all crossed for the Pumas while Georgia captain Mamuka Gorgodze was in the sin-bin shortly after the break. Tries from Martin Landajo, Cordero and Imhoff took the Pumas over 50 points. Tomas Lavanini had given Argentina an early lead but Merab Kvirikashvili's boot meant it was 14-9 at half-time. What does England v Wales mean to you? The match was finely poised at 14-9 when Gorgodze was sin-binned by referee JP Doyle. The Toulon back row was onside initially as he attempted to turn the ball over at a ruck, but he failed to support his weight and was sent to the bin. During that period, his side conceded 21 points and by the time he returned the game was effectively lost. Even with Gorgodze's helping hand Argentina seem sure to be exacting opponents for Ireland or France - who they are likely to face in the quarter-finals - with a big mobile pack, the best set of backs they have had and an eagerness to play with width. Nicolas Sanchez opened the scoring for Argentina with a first for this Rugby World up - a drop-goal, albeit an ugly one. Sanchez was then part of a terrific handling move that saw Lavanini dive over for his second international try. Impressive full-back Kvirikashvili brought Georgia to within two points with two penalties before he and Sanchez traded further kicks after the half-hour mark as the Georgians closed the half very much in the game. Juan Martin Hernandez limped off injured for Argentina with what appeared to be a groin injury and the fitness of 'El Mago' will be of concern to the Pumas. When Gorgodze was sin-binned for slowing down the ball, after a great break by Sanchez that saw Marcelo Bosch caught just short of the line, the Georgia captain might have thought the punishment was worthwhile. But with his team short on the blind side as a result of his yellow card, scrum-half Cubelli dived over after being fed off the back of a close-range scrum by number eight Facundo Isa. Three minutes later Imhoff scorched down the left touchline for his 12th international try and Cordero quickly added the fourth try for a bonus point. Landajo made sure of the victory with a dart against the tiring Georgians before wingers Cordero and Imhoff claimed their second tries to take the Pumas over the half-century mark. In the 64 minutes Sanchez was on the pitch, he gave further encouragement to the notion Argentina are going to be an awkward side for anyone to play against in this Rugby World Cup. In addition to his penalties, conversions and drop goal, the fly-half - who is leaving Toulon for the new Argentine Super Rugby franchise - ignited his backline with crisp delivery and made 62 metres thanks to two clean breaks. With the finesse and power of Hernandez and Bosch outside him and plenty of firepower on the wings, Argentina now have a backline that will cause any team problems. Argentina: Tuculet; Cordero, Bosch, Hernandez, Imhoff; Sanchez, Cubelli; Ayerza, Creevy, Chaparro, Alemanno, Lavanini, Leguizamon, Fernandez Lobbe, Isa. Replacements: Montoya, Noguera, Herrera, Desio, Matera, Landajo, De La Fuente, Amorosino. Georgia: Kvirikashvili; Mchedlidze, Kacharava, Sharikadze, Aptsiauri; Malaguradze, Lobzhanidze; Nariashvili, Bregvadze, Zirakashvili, Nemsadze, Mikautadze, Tkhilaishvil, Kolelishvili, Gorgodze. Replacements: Mamukashvili, Asieshvili, Chilachava, Datunashvili, Sutiashvili, Begadze, Pruidze, Giorgadze.